OC 405 Partners Team is pleased to announce OCTA's Board of Directors selection of our team to design and build the I-405 Improvement Project. 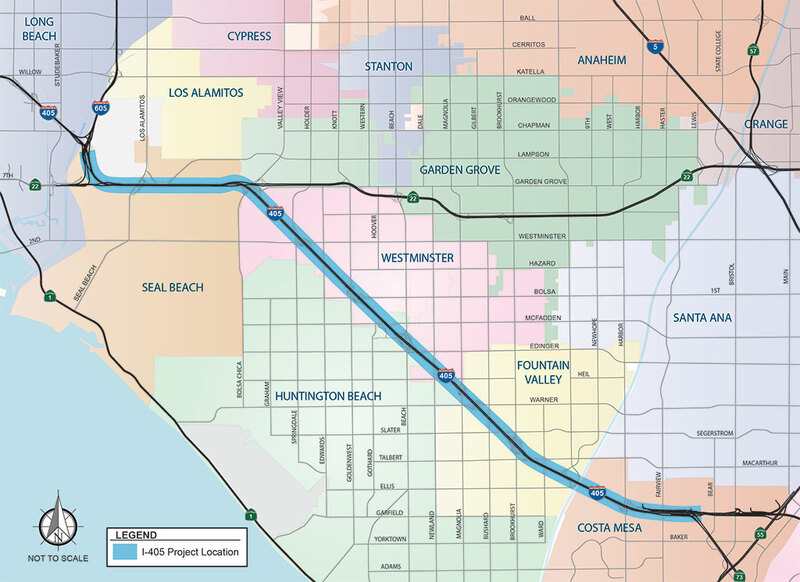 We look forward to working with OCTA and Caltrans to successfully complete this ground-breaking Project in order to provide shorter commute times for 370,000 daily Southern Californian drivers. Add a general-purpose lane in each direction of I-405 from Euclid St to the I-405/I-605 Interchange. Addition of a tolled express lane in each direction from SR-73 to SR-22. Add auxiliary lanes in the NB direction at Euclid St off-ramp; and from Seal Beach Blvd on-ramp to the WB SR-22/7th Street off-ramp. Extension of existing SB auxiliary lane from Harbor Blvd off-ramp to Euclid St on-ramp. Removal of SB auxiliary lane from Beach Blvd to Magnolia St off-ramp. Reconfiguration of interchanges and ramps comprised of 23 new or replacement crossroad/ramp bridges, one pedestrian bridge, and seven bridge widenings on I-405. New, modified or replaced structures, including two overhead railroad crossings. New and upgraded drainage facilities. Pavement construction and revised delineation. Coordination with utility owners for relocation of known utilities. Please visit OCTA’s website for additional information or public inquiries regarding the Project. Residents and businesses are encouraged to stay informed by signing up to receive project updates and alerts. OCTA has establish a DBE project goal of 16% for the life of the Project. The OC 405 Partners Team is committed to building a culture that promotes the advancement of disadvantaged businesses. Please complete the Subcontractor form here so that we can know more about your firm. OC 405 Partners team members share an uncompromising ZERO accident policy. Safety training and a corporate culture that fosters health and safety in the workplace are crucial to achieving the goal of zero accidents. Providing our employees and subcontractors a safe and secure environment by reducing/eliminating the risk of accidents are priority objectives for our Team. EVERYONE GOES HOME SAFELY EVERY NIGHT!